Simply Devine is a destination hatshop, specialising in Mother of the Bride/Groom, Wedding Hats and Ladies’ Fascinators. Run by award-winning milliner and businesswoman Liz Devine-Wright (yes that really is her name), the Simply Devine Hatshop is a popular destination for women with discerning tastes who want a special hat for an occasion when they need to look their absolute best. 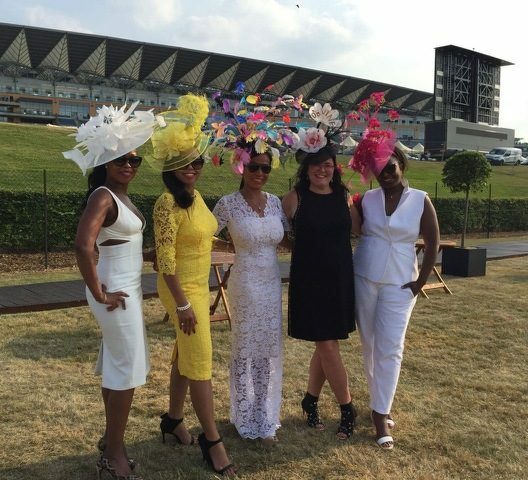 Liz and her team specialise in supplying beautiful mother of the bride, wedding hats and race day fascinators, to customers up and down the country. Customers travel from Berwick and Berkshire, Land’s End and Lanarkshire, but she is also happy to arrange special appointments for those customers who either prefer a personal service, or who are unable to visit during normal working hours. Tadcaster is conveniently situated between Leeds, York and Harrogate. Her stunning collection of wedding hats, hatinators, (not quite a full hat and sits on a band) and fascinators are designed either by herself, or by well-known British designers. With such a huge choice of designs, colours, styles and prices, there is something to suit every taste and budget for any occasion. And her range doesn’t stop there; Simply Devine also stocks accessories from handbags to jewellery to pashminas to bridal tiaras – all designed to complement your special occasion outfit. Liz is an enthusiastic networker who loves to visit friends and family, travels to fashion shows, and is always on the lookout for interesting and innovative stock, so you may have seen her zooming around the country in her Mini Hatmobile. She has even been known to personally deliver hats to different parts of the country – if she is passing nearby on her way to somewhere else! 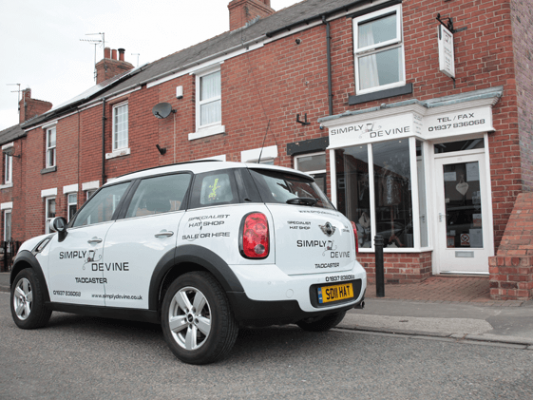 Her Mini Countryman with Simply Devine livery and personalised number plate SD11 HAT (of course!) is very distinctive, so look out for her and give her a wave if you happen to see her passing.